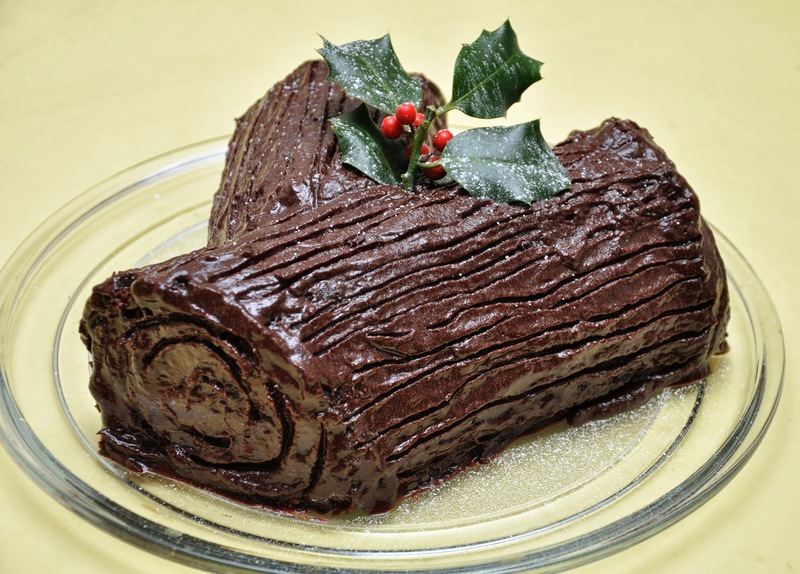 Here is my Christmas log. This is a great alternative to the traditional Christmas cake. I made the sponge a day before and rolled it in baking paper. It was easy enough to fill with whipping cream and decorate with chocolate ganache. Oh, and don't forget the holly leaves. Uncurl the cold Swiss roll and remove the paper. Spread the bramble jelly and whipped cream on top, and re-roll tightly. Cut a quarter of the cake off from the end on the diagonal. Transfer the large piece of cake to a serving plate and angle the cut end in to the middle of the large cake to make a branch. Withe spatula, cover the cake completely with the chocolate ganache. Create rough bark texture with a fork. Dust with icing sugar and garnish with fresh holly.